We got an email recently from the commander of the 480th Fighter Squadron in Afghanistan noting that StogieGuys.com had promoted (and participated in) cigar-giving to the troops and wondering if we could help. Could there be any other answer than “yes”? I know you don’t want these men and women to be without a cigar when they have a some precious down time. Mailing cigars to the military is pretty simple. I recommend Priority because it helps cut down on delivery time. Be sure to include some humidification device to help keep the cigars in good shape. When your package is on its way, light one up in honor of service members everywhere. And thank you for your support. Also, if you're worried that a particular address is out of date, you can use Facebook to search for an active troop cigar club overseas. 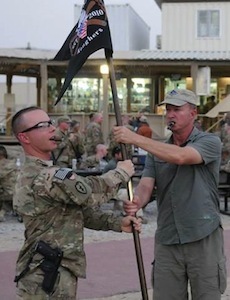 The "Tali-Banned" club and "Kandahar Koughers" both have multiple chapters in Afghanistan. You should be able to contact a member for a mailing address.